What makes a workplace great? Earlier this year, the Confederation of Indian Industry (CII) tweeted that Indian small and medium enterprises employ over 117.1 million people. However, over 70% of the jobs in the organized sector are in firms with more than 100 employees. Moreover, it is the mid-sized factories (with 100 to 999 employees), and not the large ones (1,000+ employees), that are responsible for providing jobs to the majority of the workforce, as reported in the Annual Survey of Industries (ASI). 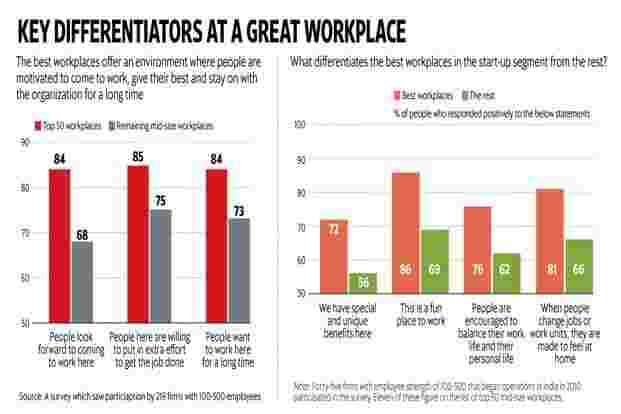 Recognizing these unique factors, Great Place to Work Institute India and Mint undertook a study to explore workplace culture trends across mid-size workplaces which have 100 to 500 employees. Great Place to Work Institute (GPTW) is a global management consulting and research firm present in more than 54 countries, and has been conducting workplace culture studies across the world. It collaborates with over 600 organizations in India annually to assess workplace cultures and recognize the best workplaces across the country. Out of these, there were 316 organizations with an employee strength of 100 to 500 employees. In its first edition, Mint and GPTW released the list of India’s Great Mid-Size Workplaces-the 50 best workplaces with an employee base ranging from 100 to 500. The study looks at workplaces from employees’ perspective, assigning two-third weightage to their voice. This is measured through anonymous surveys conducted across these organizations. 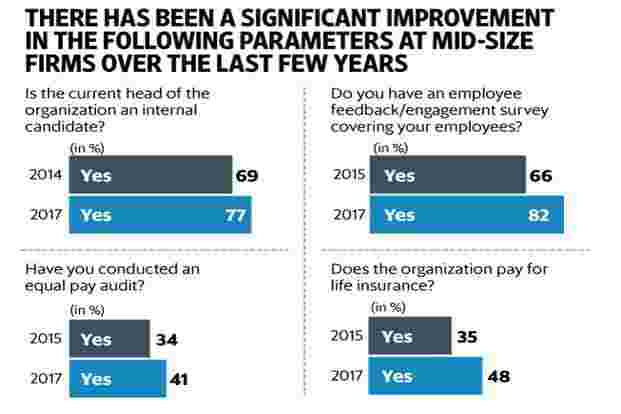 The remaining one-third weightage is assigned to the strength of people practices implemented across the organization and is measured through responses to a structured questionnaire shared with the participants by the GPTW team. A similar study conducted across hundreds of small and medium enterprises (basis employee strength) in the US revealed that the best workplaces enjoyed approximately three times the revenue growth of others in the basket. In light of this study, among others that come to the same conclusion, it is worthwhile seeing how some workplaces in this segment are progressing faster than others in terms of building a great place to work for their people. Matching the rapid pace of development in mid-size organizations over the last three years, workplace culture has also evolved significantly. It is heartening to see how organizations are acknowledging people as their key asset and going beyond “what is the bare minimum" as per government/ industry policy to “what more can be done" for their people and be the trendsetters in this space. Mid-size organizations encourage their people to take up a larger scope of responsibilities at a faster rate than large-size establishments, where roles are distributed among many people. Our study reveals that midsize organizations have a larger percentage of senior management personnel who have been promoted from within the firm (46%), as compared to large-size organizations (40%). Opportunities for on-the-job learning across a wide array of roles are many, facilitating multiple skill development for employees. As a result, high achievers are able to rise through the ranks quickly and swiftly. More and more organizations are opening up new career paths for their people by promoting internal vertical movements. At present, about 77% of the organizations in this segment have the head of the organization as an internal candidate. For example, existing employees at Mahindra Intertrade have the ‘right of first refusal’ for any new position/vacancy in the organization; 80% of their senior leadership team has been groomed internally. The Global Career Development Framework (GCF) at SAS Institute (India) Pvt. Ltd is a set of tools that provides clear visibility of job levels and career progressions, while providing resources for assessing skill gaps and developing competencies. They have gone a step further by implementing a program for interns called ‘Fresh Talent Gallop’ to help them in speeding up their career. Not only have many more organizations adopted anonymous surveys as a method to listen to their employees, they are now creating differentiated opportunities to gather employee suggestions for taking decisions. Cactus Communications has a practice called ‘Policies on Probation’, through which new policies and revisions to existing policies are put on probation for one month, encouraging employees to comment and suggest refinements. The final policy is rolled out only after incorporating opinions and suggestions from employees. This practice ensures that they genuinely listen to their people, understand their sentiments and expectations, and try their very best to deliver against their needs. At Burns & McDonnell, a 10-member cross-functional committee called Kizuna (Japanese word for bond) has evolved as the voice of employees. Employees approach Kizuna for all kind of requests and concerns other than business matters. 41% of organizations now have a practice of conducting an equal pay audit for assessing internal equity of pay across similar roles, as opposed to 34% a couple years ago. While money in absolute terms is not one of the key drivers of motivation, organizations realize that relative parity in pay as compared to peers and colleagues does matter. Promoting transparency in matters of compensation, Hitachi Data Systems has a practice of informing employees on a quarterly basis about the company’s financial performance and the effect it will have on their bonus. The message includes a secure link to an online system where employees may review the compensation calculations and view the amount of their bonus for the quarter. Going a step further from pay, organizations are increasingly moving towards the concept of “partners" as opposed to “employees" by making them beneficiaries in profit share. A case in point is Admiral Solutions, based in Gurgaon, which gives out company shares worth £750 (around Rs63,000)to every employee, besides performance-based shares on an annual basis. The one-size-fits-all benefits package is no longer the norm in progressive organizations. Offering customized benefits to support employees at different life stages and with different ambitions, organizations are making sure that the employee can focus on performance while they take care of the rest. Gozoop Online takes part in the special moments of their employees’ lives by sharing 50% of the expense, up to a certain fixed amount, for events like a date or family dinner, pet care, their favourite music concert or a sports match, gifting a gadget, getting a tattoo and a trip home (in case they are posted away from home), among other things. Relocating employees of Fieldfresh Foods have had their organization’s support in arranging for their kids’ school admission forms and interview/test dates. Centum Learning organizes grocery shopping once a month where they invite online grocery vendors who offer huge discounts and easy delivery options. At Sony Pictures, employees are discouraged from working extended hours by making it mandatory to take special permission from the Head of the Department to work on a non-working day. In case an employee does not take permission, an explanation is sought from the employee and their manager. Any study about the current mid-size workplace segment in India is incomplete without mentioning the Indian start-up segment. The past few years have seen a surge in the number of entrepreneurs in the country, further encouraged by the central government’s policies. Enabling registration of new start-ups in just a day through a mobile app, providing an initial funding corpus of Rs2,500 crore (which will be raised to Rs10,000 crore over four years), exemption from capital gains tax and setting up of incubators and research parks throughout the country will provide a major boost to our budding businessmen. According to our research, the best start-ups to work for have gone a step further and have been successful in creating an environment where innovation can thrive, through the empowering behaviour of people managers. Managers in the best workplaces in start-ups encourage people to take up more responsibilities, do away with micro-management and make room for honest mistakes that may occur as a by-product of taking risks for innovation. Contrary to popular belief, the best start-ups also encourage people to balance their work and personal life and create a fun atmosphere at work. Mid-size workplaces will not only provide maximum employment in the organized sector, they will also contribute in a significant way to India’s economic growth. Our research shows that the best workplaces outperform market indices like BSE Sensex and Nifty 50. This has been further validated through independent studies conducted by firms like RSM in India. Thus, the best mid-size organizations are also poised to be the most successful large corporates of tomorrow. However, to do that mid-size organizations must learn how to attract, retain and inspire talent. In this, they have much to learn from India’s great mid-size workplaces. Joining the unicorn club in a short time does not ensure success for the next 10 years. Investing in a high-trust, high-performance culture is the only sustainable way to grow your business.